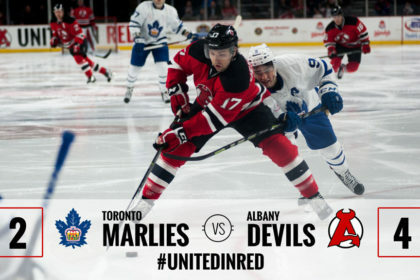 ALBANY, NY — In the last battle between the Albany Devils and Toronto Marlies on Times Union Center ice, the Devils came out on top, 4-2. 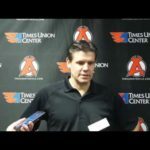 Carter Camper, John Quenneville, and Ben Sexton registered six points for the Devils as Quenneville scored twice, Sexton added a tally, and Camper had three assists. 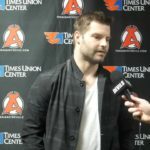 Sexton and Quenneville tied the game and gave the Devils the lead at 16:58 and 17:50, respectively, of the second period. 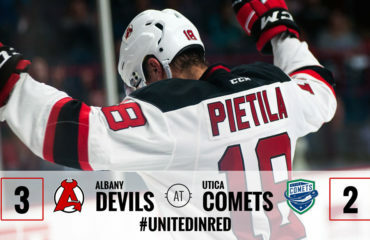 Sexton’s goal came off of a Camper offensive zone faceoff win as he fired a shot from the slot for his sixth of the year. 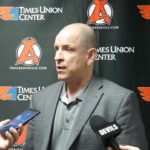 Quenneville’s second tally of the night, and game winning goal, came as Camper’s wraparound attempt found Quenneville on the back door. Quenneville came into tonight’s matchup already leading the Devils in points, and added to his total with his first career multi-goal game. 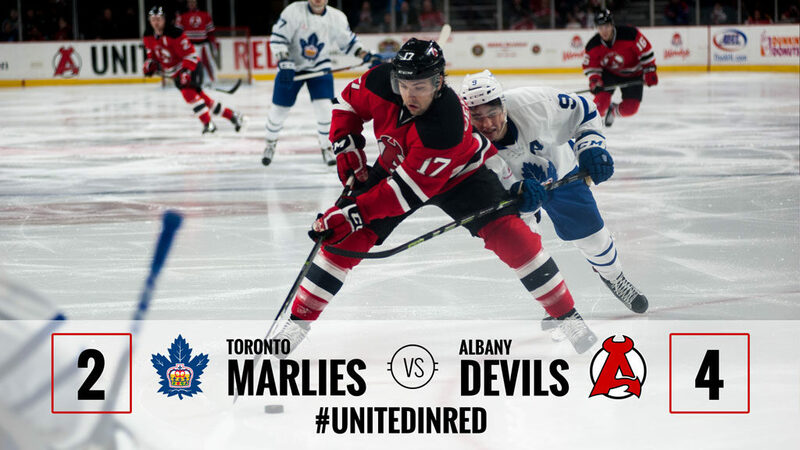 The Devils’ rookie also has six points in six games against the Marlies. 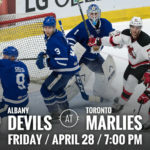 Toronto’s Colin Greening opened the game’s scoring at 2:48 of the first period when he found a loose puck in front of the net and capitalized on the opportunity, giving the Marlies the first lead of the game. 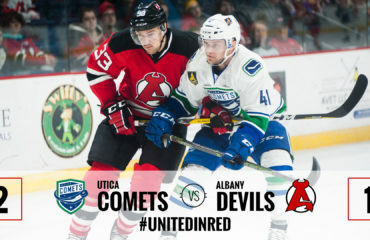 Quenneville answered with his first tally of the night to put the Devils on the board with a power-play goal at 12:45. He sent a wrister past goaltender Jhonas Enroth from inside the right circle for his ninth of the year. Reece Scarlett registered his tenth assist on the goal and Carter Camper added the secondary helper. 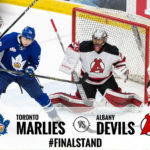 Andrew Nielson scored Toronto’s second goal at 16:01 of the second period before Sexton and Quenneville scored, and Blake Pietila added an empty net goal as time expired in regulation. Mackenzie Blackwood registered his sixth win, making 32 saves on 34 shots, moving to 6-6-1-0. Enroth was handed his first loss of the season and falls to 1-1-0-0. 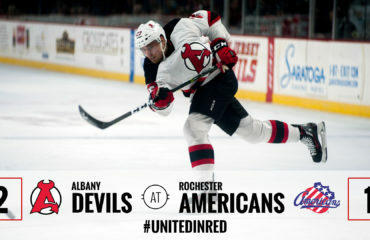 The Devils travel to Hartford Saturday for a 5 pm puck drop against the Wolf Pack.